Book review: "A Darker Domain"
This review first appeared in the February 8, 2009 issue of the North County Times. Can a book be both all-but-impossible to put down from start to finish and still a bit disappointing? 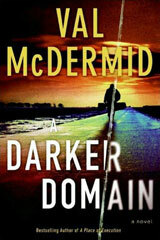 The new mystery from Scottish author Val McDermid might turn out that way for some readers. Wonderful characters you want to spend time with combine with two distinct cases that are enticingly drawn to make "A Darker Domain" one of those top-drawer tales that draws you in immediately and keeps you hooked throughout. But one of those characters is so badly mistreated by the story's events that it gives the closing a sort of sadness rather than fulfillment  kind of the way the uber-realistic TV police shows do nowadays. And that's not necessarily a bad way of telling a crime mystery, but "A Darker Domain" isn't written in that kind of hyper-real style that TV franchises like "Law & Order" or "CSI" specialize in. Not having read her numerous earlier novels, I can't say what McDermid's normal style is, but here it's a sort of updated take on Miss Marple or a Scottish version of Kinsey Milhone: Contemporary cops working in present-day circumstances, but with a soft focus, a touch of romanticism. Breaking from her previous three casts of characters (she is known for her mysteries featuring reporter Lindsay Gordon, private eye Kate Brannigan and psychologist Tony Hill), McDermid introduces Scottish police detective Karen Pirie, who investigates long-unsolved, or "cold," cases. Pirie is handed two different missing-persons cases in one week: The first is that of a union miner who left his family to go cross picket lines in the south some 22 years ago, while the second is that of an infant kidnapped with his mother that same summer  and who hasn't been seen since. As Pirie and her partner Sgt. Phil Parhatka investigate these two different cases, they find the evidence in both leading to the same mining village. McDermid does a masterful job of pulling the reader along with Pirie as she doggedly pursues these cases. Pirie is an utterly likable (if ornery) character, and McDermid does a nice job of rounding out the subjects of Pirie's investigations. Still, there's that one character who's dealt a bad hand from the start, and never catches a break. Yes, that sort of thing happens all too often in real life, but in an escapist crime novel it's a bit of a downer.